February: the month of LOVE and surely there are plenty of stories which cover the “traditional” love story. Our worldly stories, however, teach us so much more about love than just that. This month we will explore love stories, each from a different country and each with their own unique message about what it means to love and be loved in return. This week’s stories are about finding :Love Where You Least Expect It". 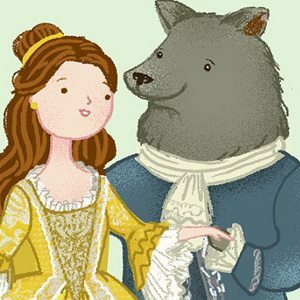 Below you will find suggestions for a Beauty and the Beast Love Lesson Plan for both grades 2-4 and 4-6. The classic tale from France of a beautiful, smart, young girl who finds herself entrapped with a hideous Beast to spare her father’s life; a Beast who turns out to be more than what he seems. A tale as old as time…..
A story from France, this European Folk Tale is a wonderful tale of love that builds from friendship. Much like Disney’s version, but with some differences, there is also a secondary plot regarding three sisters, Beauty being the youngest, most humble, and the one to put the love for her father above her own wants and needs. She willingly goes to take his place and live with the Beast, whilst her older sisters only care about their selfish ways, getting their riches back and finding husbands who will “suit” them. An exploration of love in many forms, this tale analyzes love between a father and daughter as well as love that comes from truly learning to value another for their heart and not their looks. Beauty finds “Love Where She Least Expects It”, a love grown from friendship and true admiration for ones’ best qualities. We offer two versions of this story: The Classic Version suited for a 4th-6th reading level and an "Early Reader" version in simple English suited for those with a 2nd-4th reading level. This Fairy Tale offers a wonderful opportunity to meet Common Core Standards of Comparing/Contrasting Text to Film. The animated Disney version varies from the new recent version, which more closely meets the original classic tale. Another idea is to use the text to Debate Ethics:Does the punishment meet the crime? Last, I like to use this tale to analyze Point of View and write a Fractured Fairy Tale. What would this story look like from the Beast's perspective?